Hidden in the heart of the cosmopolitan district of Gràcia in Barcelona, you can visit an original Belle Epoque atelier, the private art studio of Oleguer Junyent, a Catalan genius who devoted his life to painting, writing, collecting, and stage design. Mountain where Jesus was first tempted by the Devil. Week-long block party becomes a competition for the best decorated street. 18th century anatomical amphitheater of the Royal College of Surgery of Barcelona. Junyent’s fame stemmed from his design work for the Gran Teatre de Liceu’s operas. The most important was Parsifal by Wagner, performed in Barcelona in 1913 for the first time outside Germany. Following his success in the theatre, he decorated some of Barcelona’s most luxurious bourgeois houses, including Casa Burés and Casa Cambó. He was also leader Catalonia’s modernism movement, a contemporary of Ramon Casas and Pablo Picasso. The Junyent family still resides in the building, but they have opened Oleguer’s preserved workshop to the public for scheduled viewings. 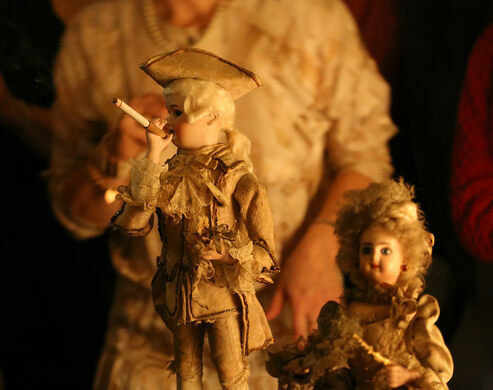 The collection is a sight to behold: In addition to Oleguer’s paintings, sculptures, models, and various other works, it contains one of the most complete collections of automata in the city after the Tibidabo Amusement Park. Its fashion collection is also incredibly robust. In addition to costumes designed by Junyent, it contains historical artifacts from the rococo, romantic, and art deco periods. Some of the paintings in the collection are masterpieces, from the medieval works by Ferrer Bassa to the avant-gardist Anglada Camarassa. The workshop also displays a series of dolls collected by Oleguer’s niece. The workshop is periodically opened for events, where guests can step back in time to the glimmering age of one of Catalonia’s most famous designers. Visits organized by the company "Cases Singulars". Barcelona's historic 19th-century sewers, whose foundations were laid in medieval times, are open to the public for exploring. Step inside the first house designed by Catalan architect Antoni Gaudí, considered to be one of the first Art Nouveau buildings. An unexpected curiosity cabinet hidden within a department store in the Japan Post tower.